No sadya is complete without pradhaman and Pal Ada is the easiest among all. Now that you get instant packets in the market, you just need to simmer the ada in the milk and cook for roughly about 30 minutes. This particular recipes uses instant ada. Add ada to a vessel and add water until ada soaks. Pressure cook for about 4 to 5 whistles. Once you turn off the heat, boil milk in a large, wide mouthed, heavy bottom pan. Boil the milk until it is reduced to almost half. Add the cooked ada and sugar and simmer for about 20 minutes more so that you get the creamy consistency. Adjust the sweetness. If you are adding more sugar, simmer for a few more minutes or else you pradhaman will turn watery. In a small frying pan, heat clarified butter. Add cashews and roast until golden. Add raisins and sauté for a couple of minutes more. 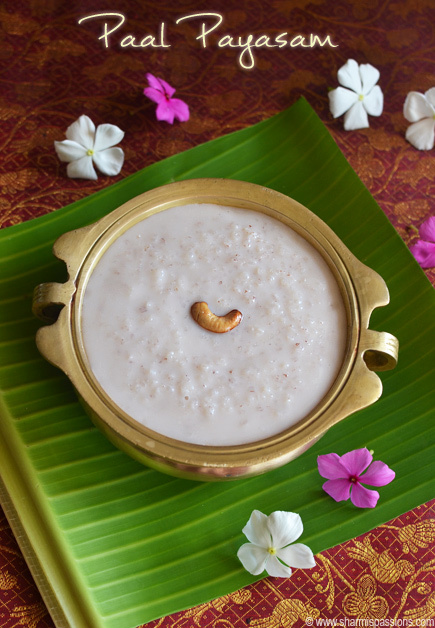 Sprinkle cardamom powder atop the simmered pradhaman and mix in roasted cashews and raisins. The Pal Ada pradhaman is ready to be served.